When it comes to online data and metrics, finding the right way to present information can be a challenge. The most important thing to remember is to keep things visual and familiar so that your team and stakeholders can easily get informed and give you their feedback. Successful data visualization will allow you to identify areas that need attention or improvement, determine which product features to place where and predict new release outcomes. You could even monetize your data to increase revenue. What we’re saying is, data visualization is key to the success of your web or mobile product. Luckily, with Justinmind’s new Charts UI library, presenting your data visually is really easy. Choose from an array of bar charts, line graphs, step line charts, XY charts, bubble charts, gauges and maps that users will recognize and be able to engage with. Download the new UI kit here! Bar charts are great when presenting comparative data because they’re easy to interpret. They’re great for representing project budgets, and web traffic and downloads. They can even be used to create product roadmaps. Line graphs should be used to track and/or compare changes over the same period of time for more than one group of data, for example to track product revenue v profit per site visit, user engagement or newsletter subscription tendencies. Bubble charts display three dimensions of data and can help you to pinpoint locations on a map – i.e. if you wanted to display where users visiting your site were based. And, there’s also a ton of gauges to choose from, including maps, compasses and speedometers. The design possibilities are endless! 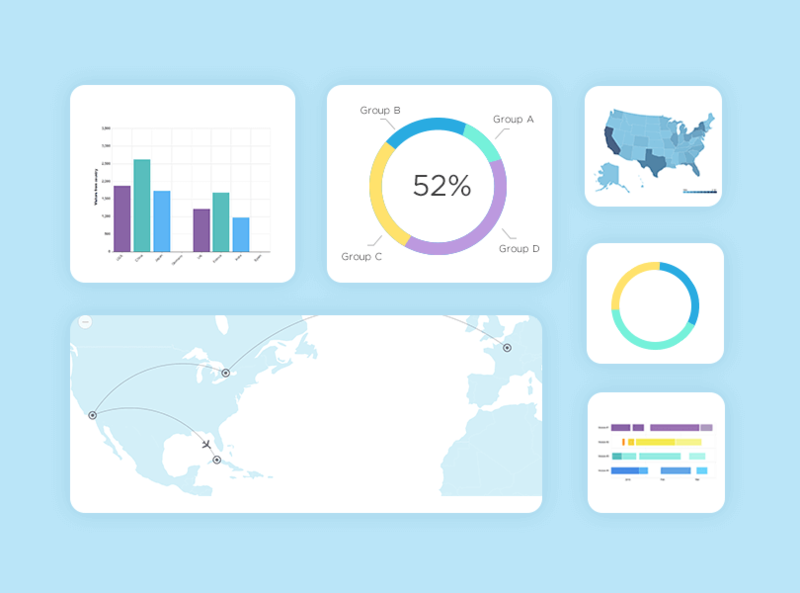 Get our brand new UI library download the Charts kit now.